Previous post: Downtown Fresno Christmas Parade Celebrates 89 Years! To prepare for the several concerts the Choir performs at each year, they usually spend three to four weeks memorizing music. However, each concert is different because of the availability of the Performing Arts Theatre (PAT) and their schedule during the year. The Choir would be extremely lucky to use the PAT occasionally because it is used so often by other groups. 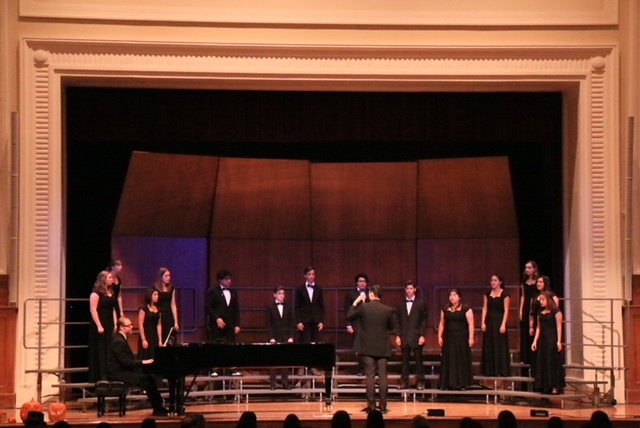 During the beginning of the school year, the Choir held their fall concert, using two weeks before their performance in the theatre to help prepare the students to sing in a foreign setting, be placed on different levels on the stage, and arranging themselves in a variety of ways. Although features such as standing or walking on and off stage and coordinating different movements may not seem difficult, it is actually very complex and requires many hours of rehearsal. Avdon Martinez comments on his experience in the choir to be “fun and exciting” as he meets a variety of new faces. Another student, Naomi Herrera, loves the welcoming atmosphere that Mr. dela Concepcion and the Choirs provide, and she also enjoys the music that they sing. Andrew Rodriguez enjoyed having Mr. DLC as a director and comments that he is “a great teacher” who helped advance his love for singing. All three students are in their first year in Choir, but are all very excited for their upcoming concerts. Since each concert is unique, some may include songs that are featured upon themes or holidays, or may have specific necessities for festival of or special performances. For the choirs’ performance in the RHS graduation, the students decide on songs that are meaningful and inspiring. 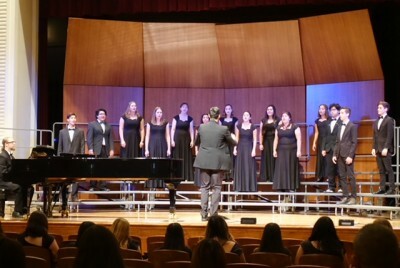 During festival, the choirs sing songs that follow the requirements of the events but are also more focused on the academic aspects of music, which help teach essential musical ideas. The fall concert featured songs such as “Bring Me Little Water Sylvie”, which involved hamboning, an African American dancing style. 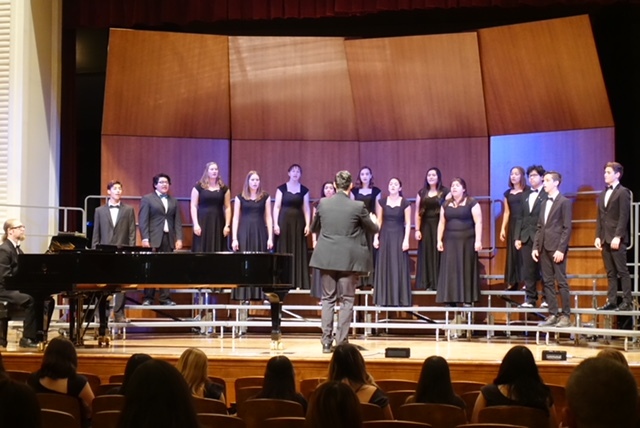 The Concert Choir mixed with the Chamber and Concert Choirs of Reedley College to sing the closer “Little David Play on Your Harp”, an exciting, gospel song that included several alumni from Reedley College. The end of the year spring performance will lean towards a more modern musical style of singing and moving. In the previous year, that show included prominent musicals including; The Lion King, Les Miserables, Rent, The Greatest Showman, Hercules, and Tarzan. The upcoming Peace on Earth Concert on Wednesday, December 5, in the RHS Performing Arts Theater at 7 p.m. will exhibit winter songs from across the globe. Some songs will have their origins in Mexico, Germany, Hawaii, the Philippines, Austria, Africa, and many more. Mr. dela Concepcion states the concert will be a unique and exciting one, with famous Christmas songs that the audience can join along in. Mr. Dela Concepcion would like to thank all the parents and the district for their assistance and encouragement to the Vocal Music Program at KCUSD. He would also like to congratulate Elicia Balladares, Heidi Harris, and Edgar Mendez for being selected out of thousands of talented singers into the CCDA Regional Honor Choir, which includes only 250 students. If anyone would like to brighten their day with joyous Christmas music, the RHS Madrigals are available! These holiday performances are being booked up rapidly, but there are still openings for any audience who would like to listen to Holiday Favorites and Christmas Carols. If you would like to request one, please contact Mr. dela Concepcion at (559) 305-7100 ext 2742 or email him at delaconcepcion-d@kcusd[doc]com.